Cobblers have announced a new partnership with Imperial Car Supermarkets that will see Imperial Cars become the new South Stand sponsor for the next three years at the PTS Academy Stadium. From the start of next season, the South Stand will be known as the Imperial Cars Stand as the long-standing partner and supporter of the club extend and widen their partnership. 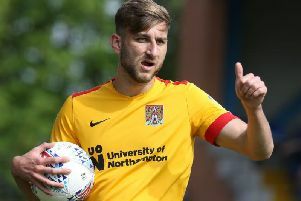 The news comes almost a year on from when Northampton revealed they had agreed to a stadium naming rights partnership, and that Sixfields was to be renamed the PTS Academy Stadium. Club commercial director Caroline Lucy said: “We have worked closely with Neil and the team at Imperial Cars and are delighted to welcome them on board as our naming rights partner for the South Stand. Neil Smith, operations director for Imperial Cars, added: “We are really excited about the South Stand at the PTS Academy Stadium becoming known as the Imperial Cars Stand. “We have enjoyed working with the club for a number of years now and we are very pleased to be extending and widening our partnership. Imperial Cars takes over from previous sponsor Moulton College, starting next season.